With conditions similar to that of the Argentina GP, the MotoGP™ World Championship began Free Practice 4. Riders would have liked the track to be in a better state, but made the most of what they were given. Marc Marquez (Repsol Honda Team) debuted a revised front fairing with a re-shaped bottom ‘lip’. For the fourth time this weekend he topped the session, no rider able to get within a tenth of him all weekend. 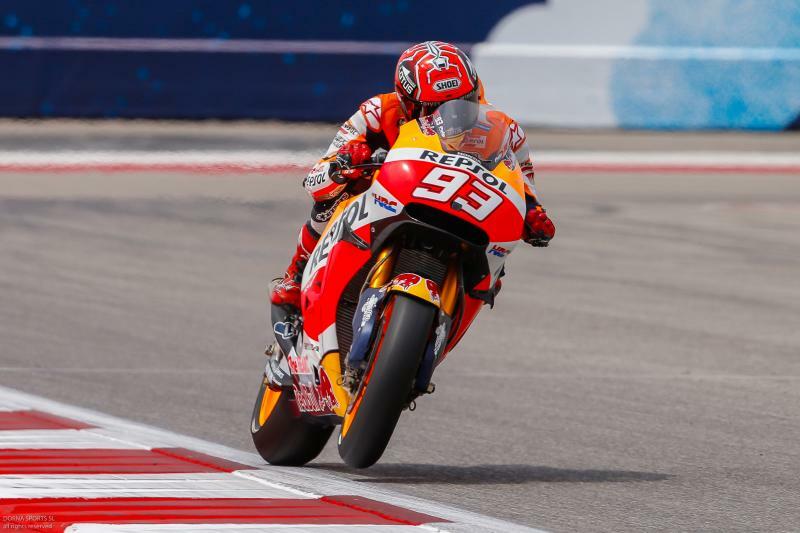 The Spaniard continued to make the Circuit of the Americas he own as he set a 2’04.309 in the less than perfect conditions. Improvements for Jorge Lorenzo (Movistar Yamaha MotoGP) continued as he moved to second, but was 0.558s back on the Spaniard. Valentino Rossi (Movistar Yamaha MotoGP) made it two Yamahas inside the top three, the pair the only riders within 0.6s of Marquez. Meanwhile Scott Redding (Octo Pramac Yakhnich) was the leading Ducati in fourth and the final rider within a second of the top. The Brit was able to end ahead of Andrea Dovizioso (Ducati Team) who completed the top five. 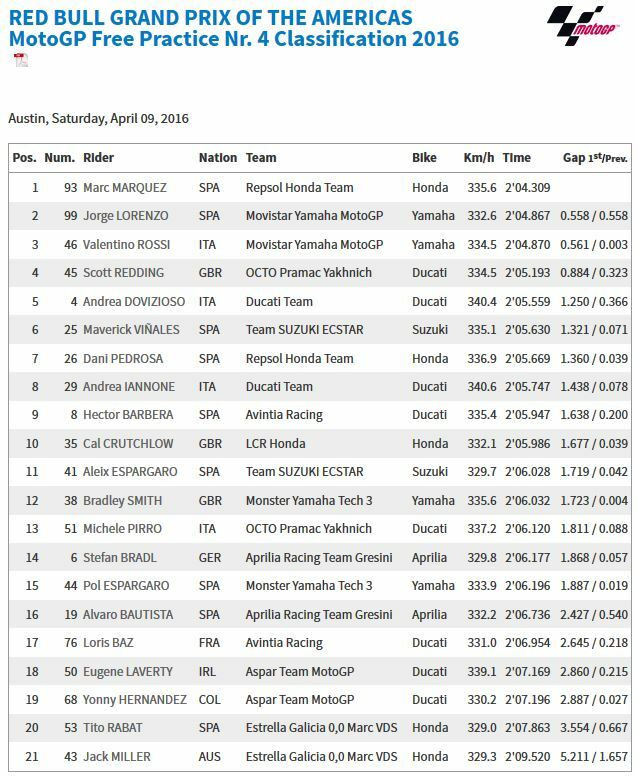 Maverick Viñales (Team Suzuki Ecstar), Dani Pedrosa (Repsol Honda Team), Andrea Iannone (Ducati Team), Hector Barbera (Avintia Racing) and Cal Crutchlow (LCR Honda) made up the top ten. Jack Miller (Estrella Galicia 0,0 Marc VDS) was the last rider to leave the pits as he nurses a broken right foot after a Friday fall. It was announced during the session that the Australian will miss the race and return to action in Jerez.